413 Racing | Crapcan racing to the extreme! 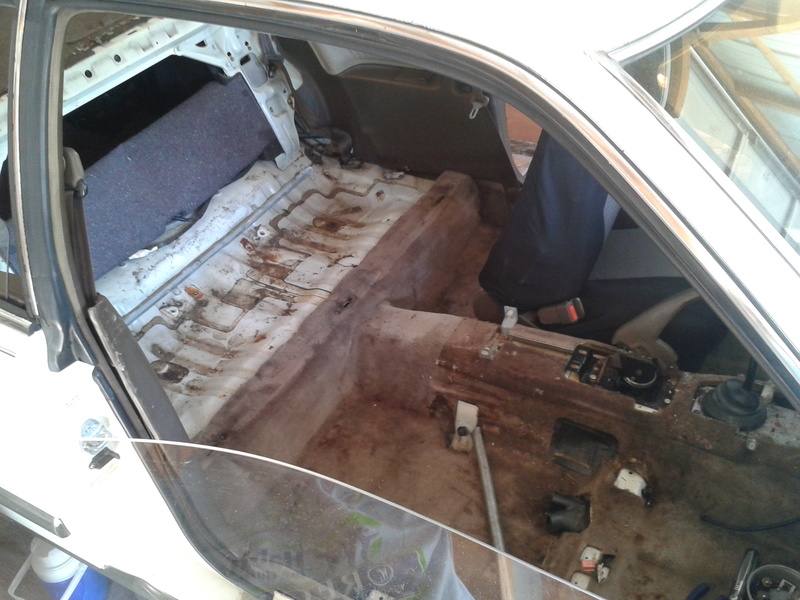 I worked on the car for about an hour last night, and I removed the gross carpet. I probably should have worn a mask, because man that stuff was nasty. It was wet in places too. Under the carpet in the foot-well behind the driver’s seat I found enough sand to build a sand box?!? Hopefully this car was never flooded, but it was probably wet from a leaky sunroof. 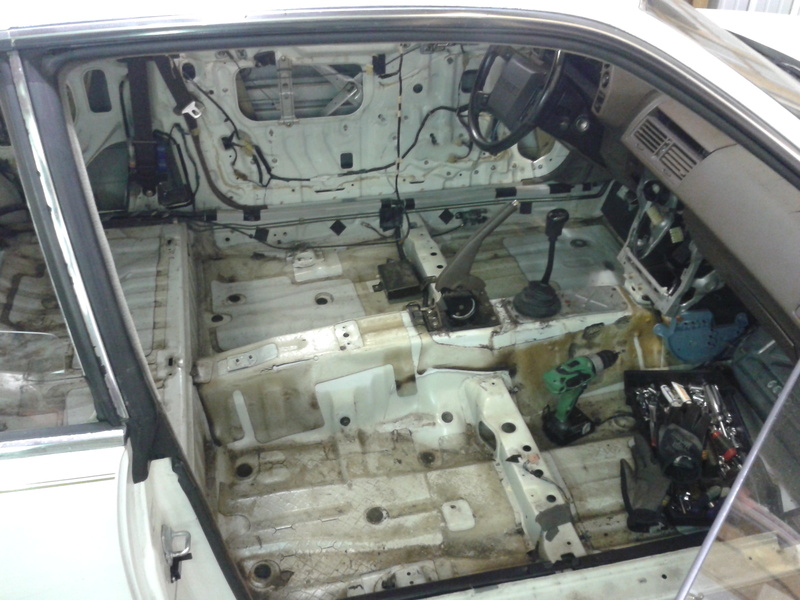 I also removed the door panels, visors, oh-crap handles, interior lights, and pulled the head liner out. 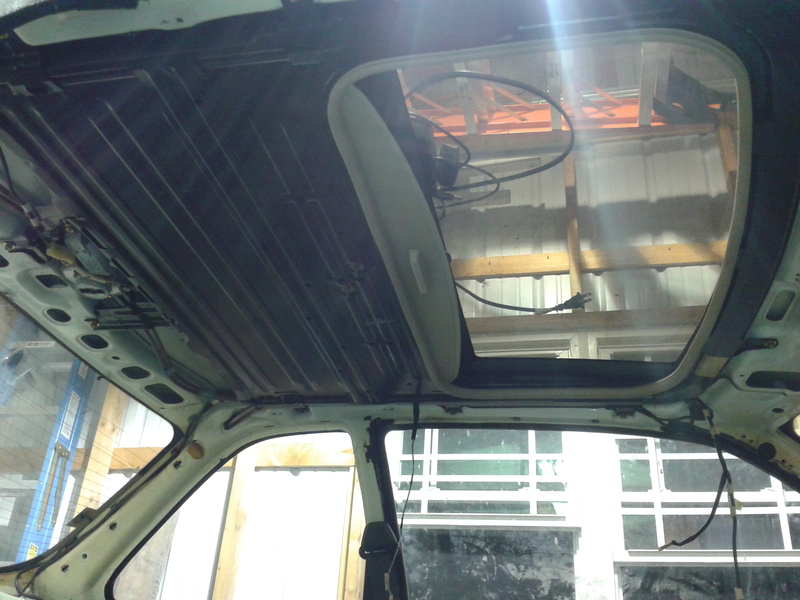 The sunroof is about ready to come out. I tried to sweep it out with a broom, but I need a shop-vac or vacuum to get all that dirt and nastiness out. It was 101 degrees yesterday, and its supposed to be even hotter today and tomorrow, so I doubt I will work on the car (or do anything outside for that matter). We will see. Today I started stripping. Thank God it’s not what it sounds like, as I’m sure I wouldn’t make much doing the other thing. 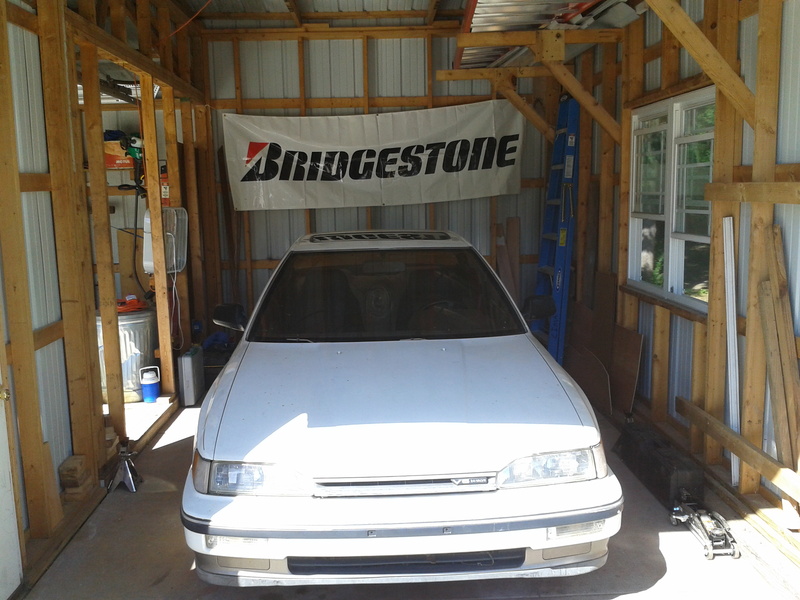 After weighing the car I decided to go ahead and start the strip work. I only ended up working for about an hour and forty minutes, because my wife had to leave and that meant I would be on kid sitting duty. 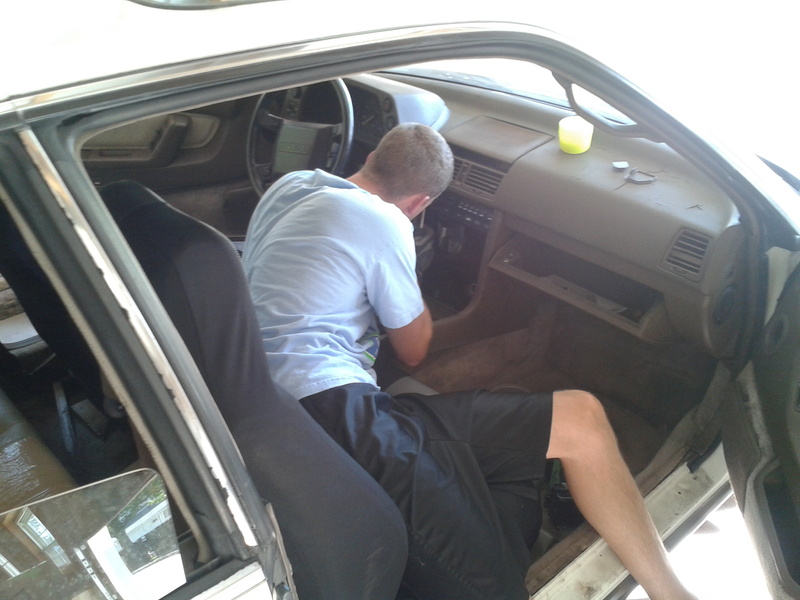 First I removed the center console, shift boot, and what was left of the stereo. Then I worked on removing the seats. The rear seat gave me a bit of trouble, just cause I had never taken apart anything other than Subaru’s prior to this, so it was a bit different. But a big pry-bar helped. The driver’s seat is heavy! Haven’t weighed it yet, but I estimate about 60 lbs. Now there is nowhere to sit! 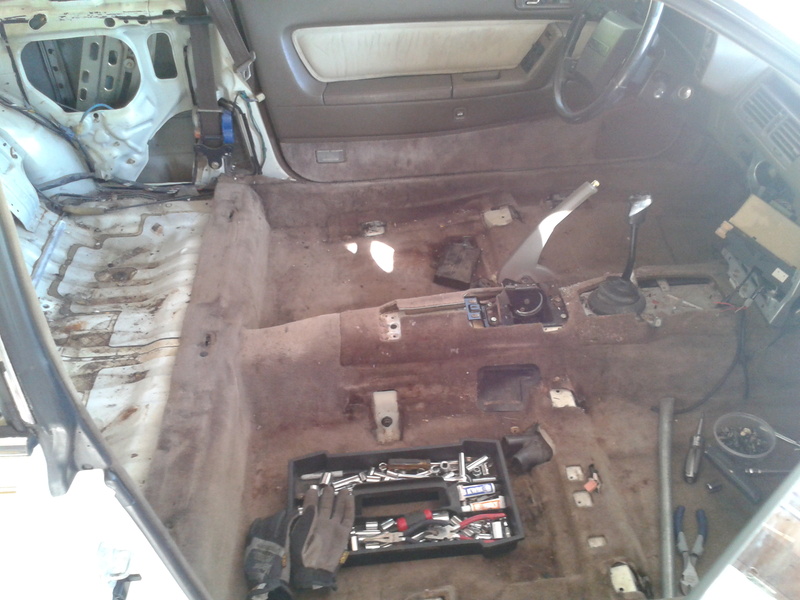 Next I removed the seat belts, window trim, and most of the plastic pillar covers. She is now ready for carpet removal. This car was/is filthy. The kinds of things that were under the seats is almost like a treasure hunt. Except the kinds of things you find you would have to pay someone to take. Pencils, pens, gold-fish, screws (drywall screws? ), money, cigarettes, asthma inhalers, and all kinds of trash. 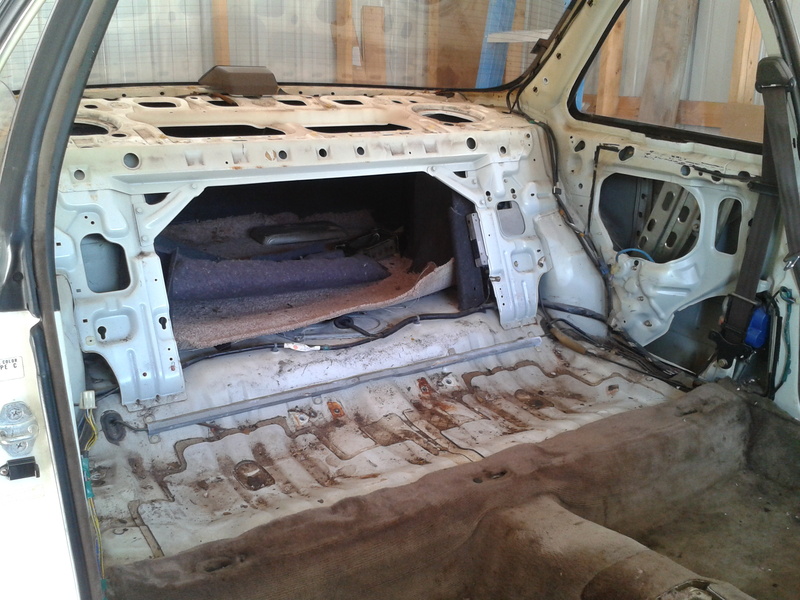 Can’t wait to get the carpet and dash out and then clean it a bit. Then it will be the trunk. However, the next few days we are expecting record heat, so I probably wont get much done. 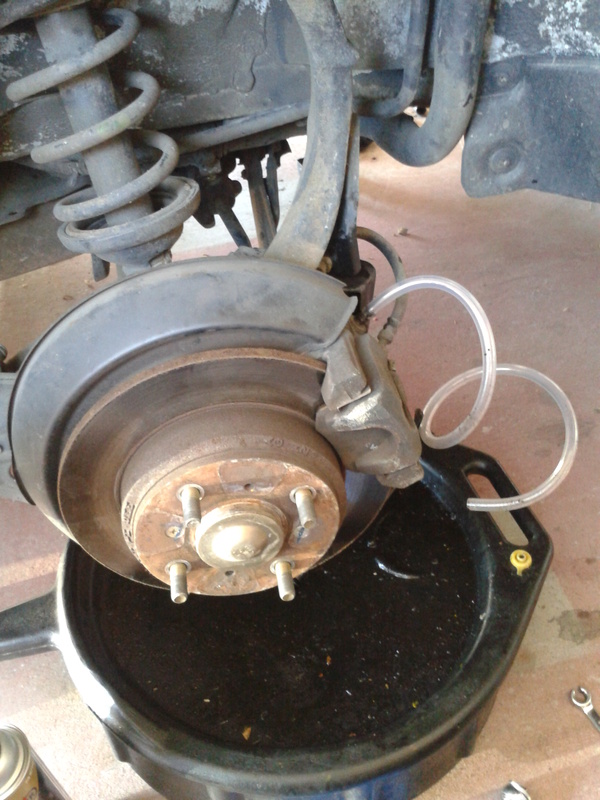 Recently my daily driver, a 2001 Jeep Grand Cherokee, has been having some shuttering under braking. I needed to get it in the garage and get the wheels off and see what was going on. So that meant I needed to get the Legend off of the jack stands, which meant the brakes needed put back together. I was having an issue with the right rear caliper when I last worked on the car. Not really an issue I guess, but the piston on the rear calipers is a screw in type. It’s pretty difficult getting that piston screwed back in when you need to change brake pads. I started working on it, then moved on to something else, and eventually forgot about it. 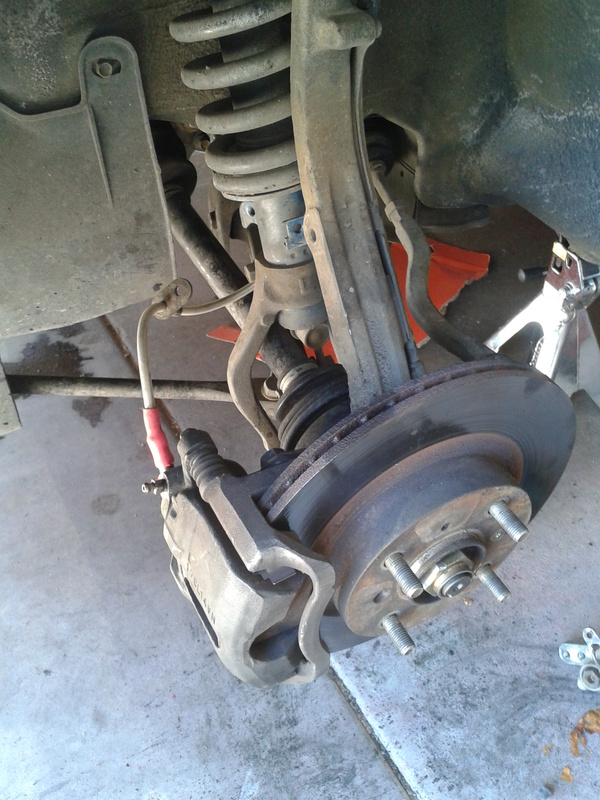 I put all the other rotors on, put the calipers back on the other three corners, tightened everything down, and gave the brake pedal a few pumps to see how it felt. When I got out and walked over to my tool box, it was then that I realized I hadn’t finished the right rear and the caliper wasn’t attached. With my previous pumping of the brakes, since there was no rotor for the caliper to clamp on, the piston in the caliper came out and was laying on the floor in a pool of brake fluid. crap. Took a bit, but I got it back in properly and screwed in all the way. Then I decided I needed to bleed the brakes. Which meant I needed to go to the local auto parts store for more brake fluid, brake cleaner, gloves, and some 1/4″ tubing. Once I got back from the store, I asked my wife if she could help me out (I needed someone to pump the brake pedal). I followed the sequence in the manual, which is Left Front (LF), Right Rear (RR), Right Front (RF), Left Rear (LR). I used some cheap DOT3 fluid because I know I am going to be bleeding again when I put race pads on and new rotors before race season, so I figured I would use the good stuff then. It’s a good thing I bled the brakes. I have never seen brake fluid so disgusting. In the front it was a dark red/amber color, and thick. In the rear it literally looked like chocolate milk with rust in it. Its amazing stopped when I drove it before. But now it is all clean and good to go. The pedal felt nice and firm on the quick test drive. I can’t wait for the race pads! After the brake job, and the diagnosing of the Jeeps issues, I decided to clean out my work space a bit. My parents had been storing some of their stuff in my garage while they were renovating their house. Now that they have moved everything out, I have space again! 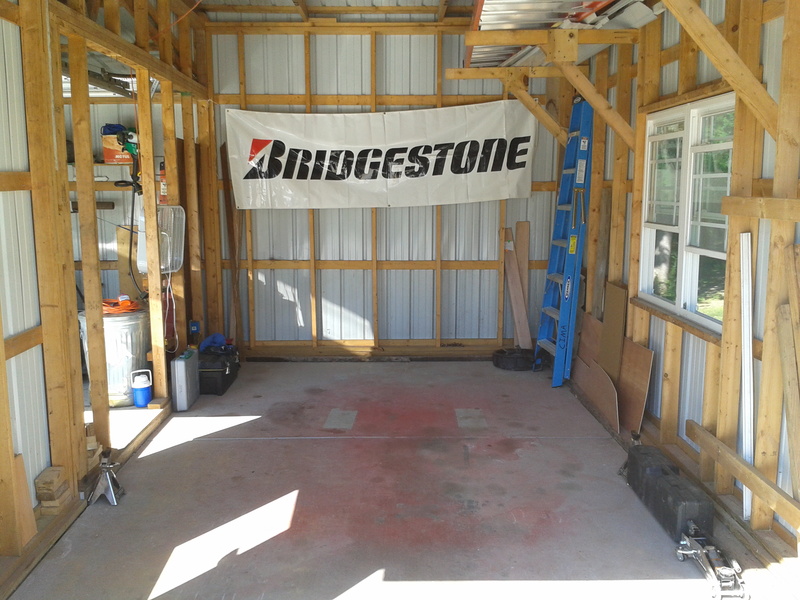 I moved all the stuff that was behind the car, over to the other bay in the shop. Now my work area is clean and ready for the real work to begin! I also ordered some other parts for the Jeep. 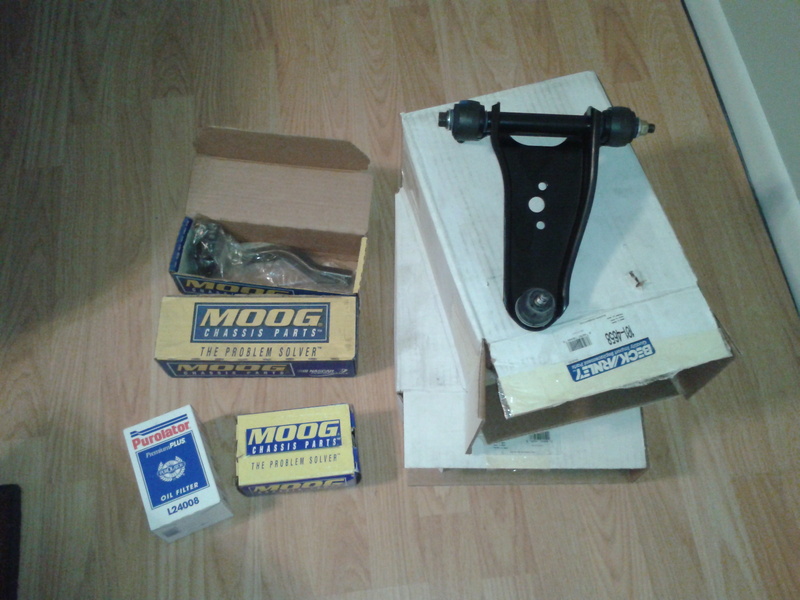 Once the parts come in I will begin installing them, but in the meantime I am going to start stripping the car. 413 Racing Now On facebook!